Traveling internationally with your child? Your child will need to have a valid minor passport. Child passports valid for five years are issued to US citizens age 15 and younger. At age 16, US citizens are eligible for an adult passport valid for 10 years. Passports for minors cannot be renewed. The procedure to get a child US passport is the same whether or not the child has previously been issued a passport. This guide will show you how to get a passport for minors, including requirements, application procedures, and how to get a minor passport fast. Child passports can be issued to any US citizen age 15 or younger. There is no such thing as being “too young” to need a passport – even newborn babies need a minor passport in order to travel outside the US. Both parents or legal guardians must give their approval for the child to be issued a passport. They can do this in person at the Passport Acceptance Agent (see Step Two below) by appearing together with their child. If one parent cannot go to the Passport Acceptance Agent, they can give written consent with a notarized government form. DS-11 Application Form for a Minor Passport, completed offline or filled out online at https://pptform.state.gov/ and printed. The child passport application form is the same one that is used by adults who need to get a new passport. Both parents and the child will need to visit a Passport Acceptance Agent to have the passport application sealed into an official envelope. Passport Acceptance Agents are located at major US Post Offices and at Clerk of the Court offices. To a nearby location, visit //passportinfo.com/passport-offices/. You may need to call to make an appointment with the Passport Acceptance Agent. The child must appear in person, and must be accompanied by at least one parent. If the other parent is not present, the “Statement of Consent” form is required to show that the absent parent also gives permission for the child to be issued a minor US passport. By Mail – The Passport Acceptance Agent will mail the sealed envelope to be processed at the National Passport Center. At a Passport Agency – If you are in a hurry for a new passport, you and your child can visit US Passport Agencies located in major US cities, where the passport will be processed on-site. By a Passport Expediting Company – If you are in a rush to get your child’s passport, you can send the sealed envelope to a reputable passport expediting company, who will hand-carry their application to a Passport Agency and obtain the child passport fast. Applying for a child passport by mail will take up to 8 weeks to receive the passport. Expedited service for a child passport by mail is available for an additional $60 government fee, and the minor passport will arrive in 2-3 weeks. If you really need to expedite your child’s passport, you can either go to a Passport Agency in person or use the services of a passport expediting company. These companies can rush a child passport in as little as 24 hours. There are 26 Passport Agencies located in cities across the US. To visit one, you must make an appointment by calling the National Passport Information Center at 877-487-2778. 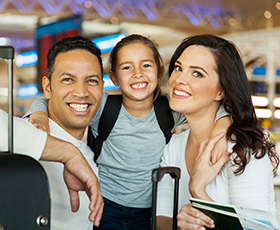 Using a passport expediting company is super fast and much easier – no appointments needed, and no need to travel to take your child to a Passport Agency.